Unakite is named after where it was first discovered, in the Unakes Mountains oin North Carolina. It is composed of pink orthoclase feldspar, green epidote and quartz. 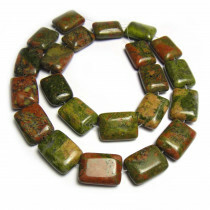 Unakite beads are considered to be balancing and said to be an excellent stone for unifying emotional, mental and spiritual aspects. 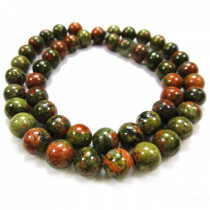 Unakite Round 10mm Gemstone Beads (~40pce Strand) - 40cm /16'" Strand. 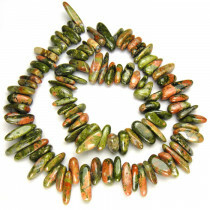 Unakite Round 8mm Gemstone Beads (~50pce Strand) - 40cm /16'" Strand. 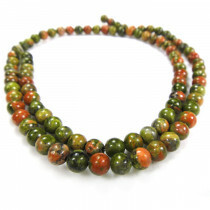 Unakite Round 6mm Gemstone Beads (66pce Strand) - 40cm /16'" Strand. 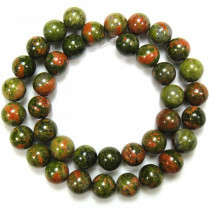 Unakite Round 4mm Gemstone Beads (~100pce Strand) - 40cm /16'" Strand. 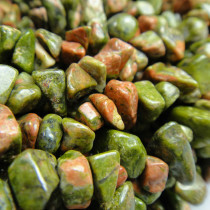 Unakite Gemstone Chips 5x8mm (~160pce Strand) - 91cm/36'" Strand. 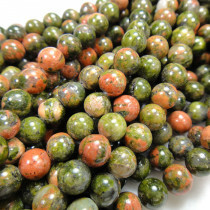 Unakite Long Chip Gemstone Beads Approx. 6x20mm (~95pce Strand) - 40cm /16'" Strand. 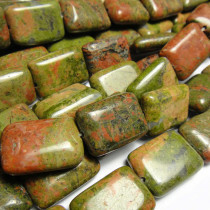 Unakite 13x18 mm Rectangle Gemstone Beads (~22pce Strand) - 40cm /16'" Strand.